Homeschooling with minimal stress may seem like a mythical wish. However, with the right tools and tips, you can reduce the stress that goes with teaching your kids at home. Relax for a minute and go over these handy hints I’ve learned with experience over the years. Each family is different. However, we can all try new things to enhance our homeschooling experience. Tear out and laminate workbook pages and put them in binders for each subject. Arrange the page order according to level. If you make a big one that contains all levels and areas of math, you won't have to purchase any more math workbooks the following years and you have work for all your kids. Just pull out the pages one at a time and give them to your child with a write & wipe marker or crayon. 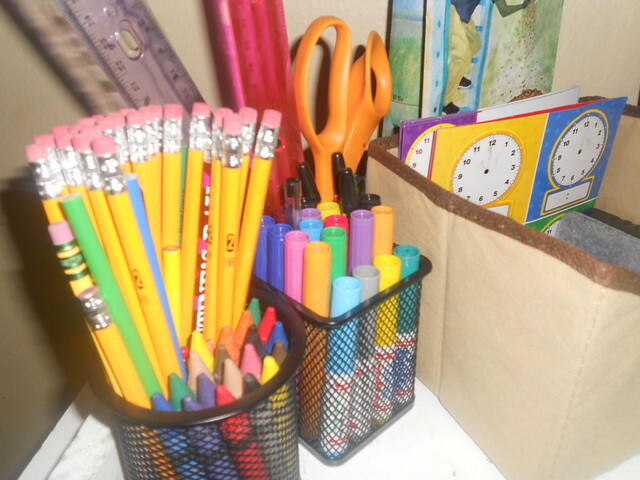 Then, when your child is finished and the work has been gone over, you can easily put it back in. You may want to take a Sharpie and number the pages in the order you want them. That way if more than one child has a worksheet, you can easily remember where they belong. Plan ahead. If you try to write or figure out the assignments while school is in session, this can stress you out. I recommend taking a weekend to plan a month or so of assignments. That way you can easily give the assignments to your child/ren when it's time. Organize each subject for each child. Each child should have a folder for each subject. The assignments should be placed in those folders in order of when they are to be completed. Even though some assignments won't have a worksheet, there should be instructions for each assignment (even if it's just reading). All assignments should have a date on them. You can even stick the write & wipe sheets (or the page numbers for them) in the folders, too. This makes the day run much smoother. Never ignore a question your child asks. If you don't know the answer, don't stress. Just look it up. That’s what search engines and educational websites are for. You don’t need to know everything in the world in order to homeschool. All you need are tools to learn with. Use different methods for teaching the kids. Try various ways to instill each lesson, such as chalkboard and lecture, books, games, worksheets, drawing, writing, and more. You should use two or more strategies for each lesson. That way your child/ren won't get bored and they will also learn many different methods for solving problems. Add family yoga or meditation to your routine. If you and the kids are having a hard time relaxing, yoga or meditation can help. Be sure to choose the right times to do the yoga, as well as the best relaxing music for everyone. For us, doing a warm-up before assignments begin and a cool-down at the end of the day is perfect. Native American songs are usually our preferred musical selections. Did you know that yoga can actually increase concentration and focus in the homeschool classroom? Have Fun! Enjoying the process is one of the most important aspects of homeschooling. If you and your child are both having fun, homeschooling is more likely to go smoothly with minimal stress.